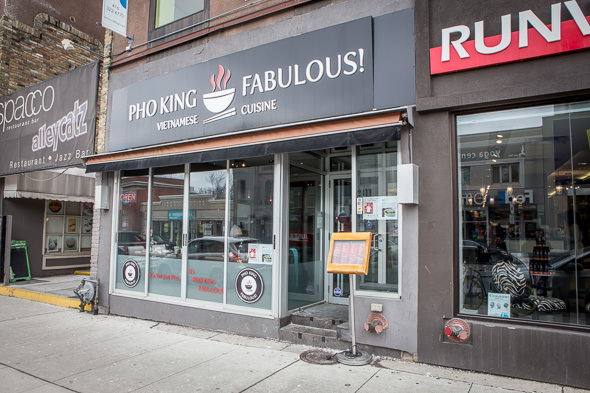 Pho King Fabulous better live up to its name, I think as I walk through the door of the Yonge and Eglinton-area Vietnamese restaurant. 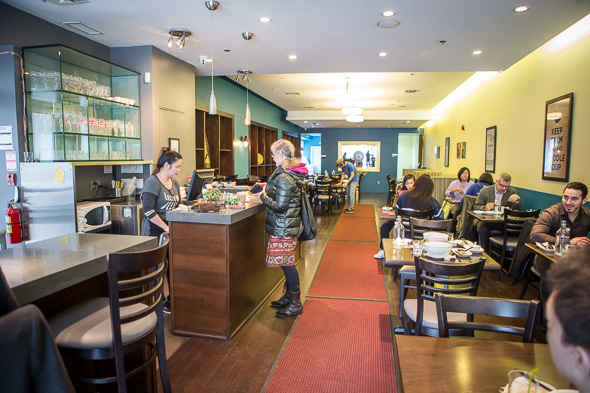 First-time restauranteur Kevin Hoang, who's originally from Ho Chi Minh City (formerly Saigon), spent more than 25 years working as an I.T. manager, but left that career to become his own boss. He tested out pho recipes on his family and worked with his daughter - who's in marketing and advertising - to come up with his memorable, if slightly explicit name. And the pun seems to be working because when I visit just after lunchtime on a Thursday afternoon the place clears out a few packs of office workers. The large, narrow room is decorated with framed posters and there's space for both intimate dinner dates and large group meals. 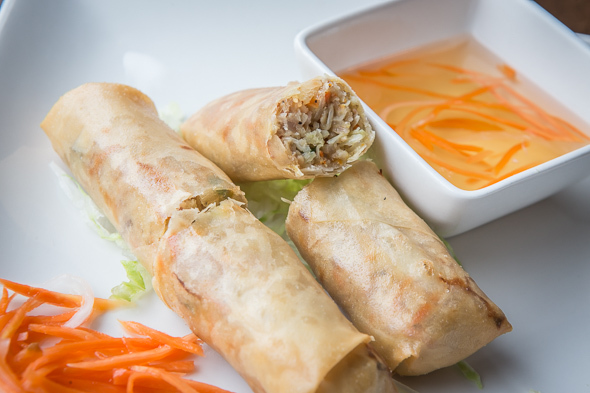 I sit near the window and start off with a duo of spring rolls, both fresh and fried. The fried pork-filled rolls ($5.25) have a thin and crispy exterior. I'm partial to the fresh rolls ($5.95) largely because the made-in-house peanut sauce makes up for the overwhelming amount of iceberg lettuce. 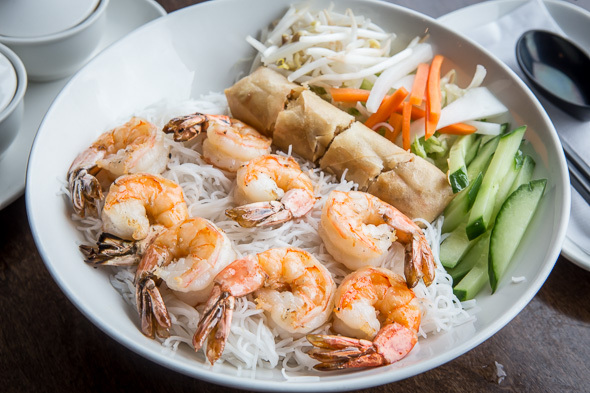 The Bún, or rice vermicelli, dishes are massive. 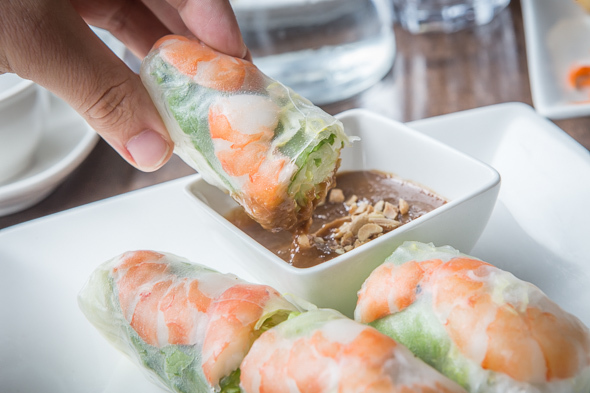 I get one with grilled shrimp (tôm nướng, chả giò) and it also comes with pieces of fried spring rolls and pickled veg ($12.95). Com, rice dishes, are similarly huge. 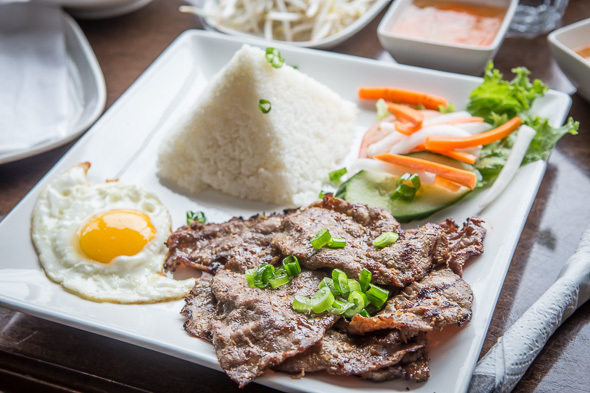 My bò nướng, grilled beef, platter ($11.95) is prettily arranged with a pyramid of rice, thin slices of flavourful beef and a runny sunny side up egg. 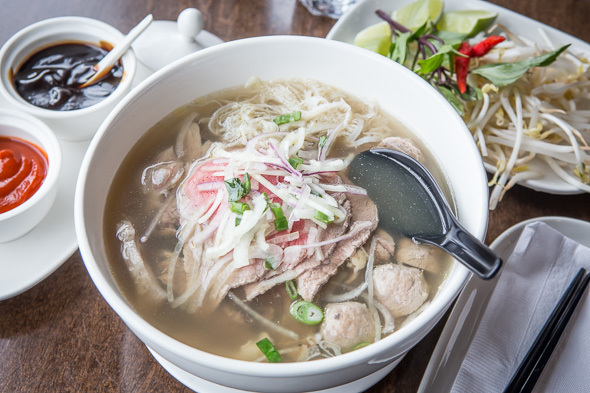 The showstopper, of course, is the pho. I go the traditional route and try the fabulous pho ($8.50/$9.95). I slurp up rice noodles that come swimming in a hearty and beautifully spiced beef broth with rare eye round, well-done brisket, soft tendon, tripe and beef meatballs. 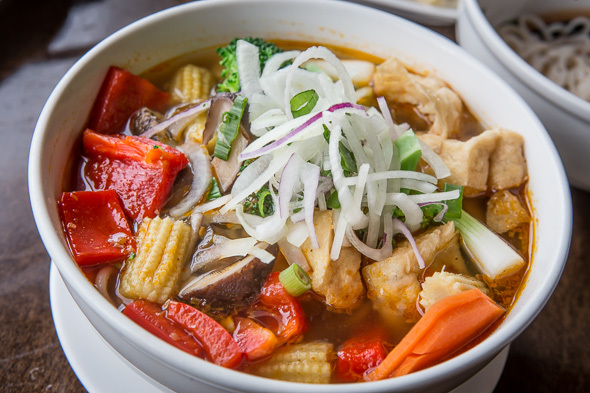 For non-red-meat-eaters there are chicken and seafood noodle soup options available - herbivores take not because there's even vegetarian pho on the menu. The spicy vegetable noodle soup is a standout for me (rare beef makes me anxious). The smaller size ($8.75) is still hefty and comes packed with an assortment of veggies and thick vermicelli noodles. The broth has a nice kick to it, but it's not too fiery. 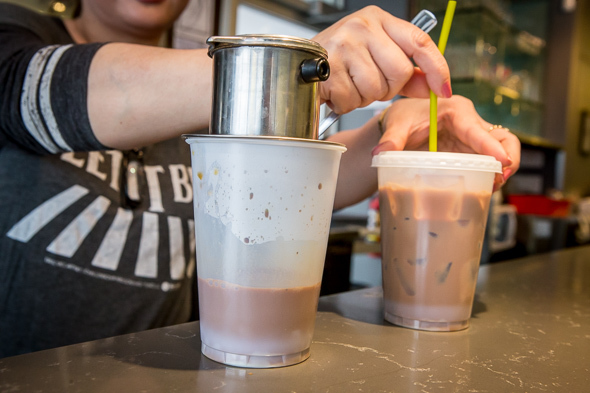 Dessert options are limited, but I cap off my meal with cà phê sữa đá, an iced Vietnamese coffee with condensed milk ($5). To savour it, I force myself to sip this sweet, caffeinated drink slowly. 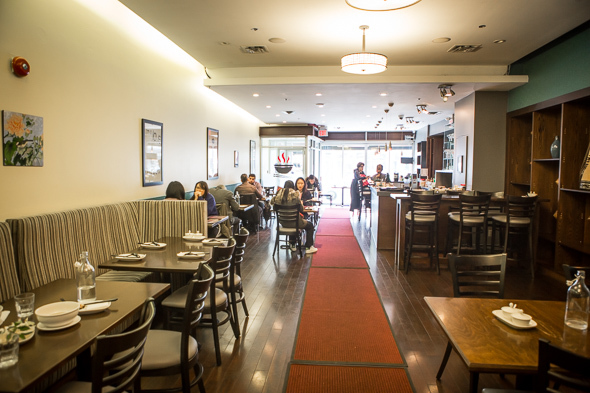 Hoang and his team do a brisk take out service as well as customers walk in for an un-pho-gettable experience - and yes, Hoang admits that was another potential name for his midtown eatery.